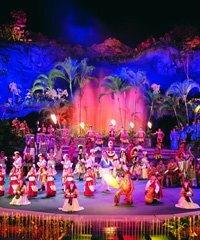 Oahu dinner shows are the most famous to be found in Hawaii. 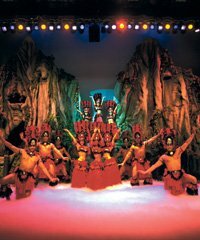 Since the days of Don Ho, Waikiki has been known as the place to spend a night out on the town enjoying a dinner show and entertainment. We offer many of these shows at excellent discount pricing. Do you still have questions about Dinner Shows? Now That Don Ho is Gone is there someone who has taken his place on Oahu? Will we be able to snorkel and see other fish and coral formations when we swim with the dolphins on Oahu? The Paradise Cove Lu'au is the largest lu'au in the state of Hawaii. Prepare to be social for this one because the "aloha spirit" is alive and well at Paradise Cove. Every effort has been made to provide you with "all things Hawaiian" including various participatory games, demonstrations and the sharing of arts and crafts. Considered to be the largest paid attraction in the state of Hawaii, the Polynesian Cultural Center on the North Shore of Oahu is a Hawaii 'icon' and is a 'must visit' when you come to Oahu. All the major cultures in the Pacific Rim are spread out in replicas of island villages with traditional housing and complete with actual South Pacific islanders dressed in traditional garb who are there to interact with you regarding all aspects of their island lifestyles. One of the longest standing of all lu'aus in Oahu is Germaine's Lu'au. This lu'au has been a tradition of sorts for decades and generations of visitors have enjoyed the food, cocktails, entertainment and overall fun that happens here. 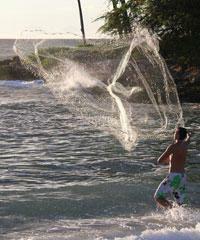 The lu'au itself is located on an isolated private area along a white sand beach in West Oahu. Seeing the 'Magic of Polynesia' illusionist show in Waikiki will make you believe that Houdini has returned from the dead and reincarnated himself in Waikiki just for this performance. John Hirokawa who studied under David Copperfield years ago has created an amazing show that will keep you guessing to the very end. A powerful performance! 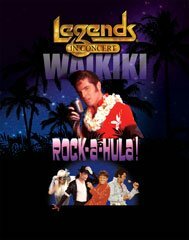 Treat yourself to a real night out on the town with this performance of 'Legends in Concert Waikiki'. 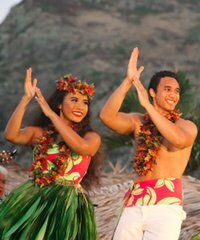 Elvis Presley, Michael Jackson, Britney Spears, Stephen Tyler, Elton John and many others will perform a night of 'Rock-a-Hula' as they combine their own unique style with that of the Hawaiian culture. 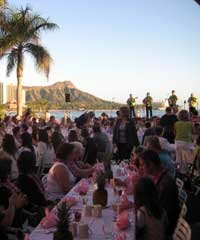 Enjoy a dinner or cocktail show at Waikiki's famous Royal Hawaiian Hotel. One of the most famous Hotels in all of Waikiki is the Royal Hawaiian Hotel, affectionately known in Hawaii as "the pink lady". The Royal Hawaiian hotel was in fact the very first hotel built on Oahu and in Waikiki. 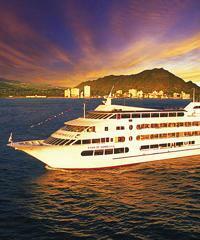 This is a fabulous location for one of the very best lu'aus you will find on Oahu, the Royal Hawaiian Lu'au. Along the shores of Waikiki at the Aquarium on Oahu enjoy a Farm to Table Lu'au with Diamond Head crater dominating the skyline. 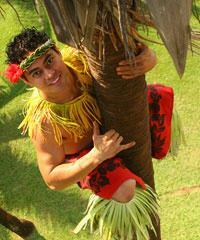 At the Sea Life Park on Oahu enjoy an authentic Lu'au with a Buffet dinner created by Chef Joshua Bullock. 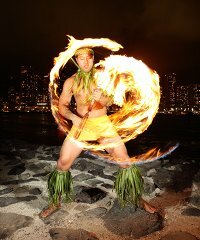 Waikiki and Oahu have always been known for their nightlife and their dinner shows. For many, many years, we were fortunate enough to have Don Ho here in Waikiki. He became a legend. Unfortunately, he's not with us anymore. He set the example and created the stage, essentially for so many other acts to come in, productions to set up and do special dinner shows. There are a number of them that are available in Hawaii, on Oahu. You can please look at the choices that we have on our dinner shows page. It's a great way to spend a night. Oahu and Honolulu, Waikiki is one of the few islands that we actually have some entertainment that occurs at night, other than a Lu'au. Maui does have some. Primarily, you're at a loss, with an exception of a Lu'au on the other islands. But you've got a lot of choices of cool things that you can do and extend your vacation, hours into the evening hours and enjoy yourself in this way on Oahu. 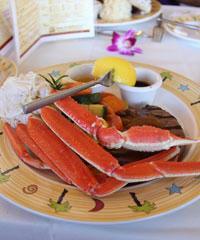 Dinner shows, a great thing to do on Oahu. 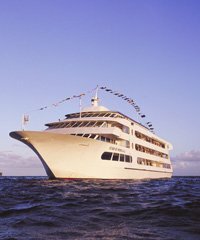 Questions about Tours or Activities in Hawaii, just give us a call or check out TomBarefoot.com.